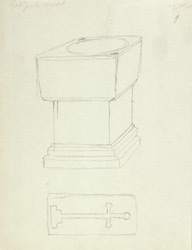 An outline sketch in pencil of the font at Radipole church, near Weymouth in Dorset. The village of Radipole was an early Roman settlement and one of the first harbours established by the empire in England. Its church has been dated as early as 1250AD. George III kept a summer home, Gloucester House, in the village. This has now become a hotel.